On an early winter morning I rise before dawn and get my toddler ready for the day. I swaddle him in warm clothes before dropping him off at childcare. I then make my way along winding country roads to the nature center for a day of snowshoeing and teaching winter animal signs. It is cold this morning. The stars were out as I went to bed and all night long the lack of clouds meant what little heat we'd gotten from the sun the day before was radiated straight out into the cold blackness of space. It was so cold that objects cooled down faster than the surrounding air. The varied natural and man made objects that make up the view on my commute all dropped below the dew point. When this happens in the summer, we wake up to a covering of wet dew. 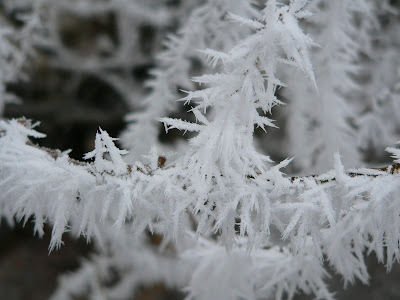 When it happens in the winter, we're greeted in the morning by a covering of hoar frost. The air cannot hold onto what little moisture it has and it condenses on the cold surfaces of tan colored dried grass, the tips of green conifer needles and the edges of brown oak leaves still clinging to their branches. The conditions that cause hoar frost to form require a cold cloudless night so it shouldn't be a surprise that many frost-covered mornings are also cloud free as well. When the sun rises high through a brilliant blue sky it lights up billions of ice crystals that have delicately outlined the world in sparkling white. These are the mornings that make the cold worthwhile. Hoar is an ancient word from Old English and one not heard much outside of the natural history world today. It originally meant old, gray and even venerable. The term hoar frost came about in the 13th century as people thought the frost looked like an old white beard on the land. Hoar frost is the most common usage of the word today but in the plant world we find Hoary Allysum, a delicate flower that makes horses mildly sick when they ingest it. The hoary in this case refers to the small frost-like covering of hairs on the stem of the plant. In the bird world, we have Hoary Redpolls, small frosty looking striped birds from above the arctic circle that sometimes visit our Minnesota bird feeders in the winter. We even have a Hoary Bat in Minnesota who's brown fur is frosted in white. It is ironic to me that the word hoar, who's root meaning is old and venerable, is use to describe something so new and ephemeral. It is a treat to see the sun lighting up the newly frosted world as I drive to work in the morning. These frosty days may be some of the coldest of the year but they are also the most beautiful. I cherish these cold frosty mornings but they don't last long. The same sun that makes them so beautiful also soon burns off the frost and takes the winter sparkle off the land.